Don't Forget, my alternate gallery is at http://iwantpurplehair.rubberslug.com!! 2/19/08 - Believe it or not, I really am still here. I actually have some stuff to add soon. Crazy huh? I've sold a few more things and updated the gallery accordingly. Thank you so much to those of you that bought them. I can still be reached at the same email if you need anything! 10/9/06 - He's finally gone ;_; Who? The Ultimate Majin cel. At least he's gone to a loving home. There are still a couple things left if anyone is interested, just drop me a line at dragonballcity13@yahoo.com! 4/7/05 - I'M SELLING OUT!! Well, sort of anyway ^_~ I've put 'BUY NOW' buttons on almost everything, and drastically lowered prices. Yes, I realize the prices of DBZ cels are going down the toilet. Anyway, with the buy now buttons you can pay by paypal or credit card. You DO NOT have to have a paypal account, and you do not have to sign up for paypal in order to use your credit card. The cels that are listed 'NOT FOR SALE' are absoutely not for sale. They were given to me as gifts and I have no plans to part with them. As always - just email me with questions! 12/18/02 - Happy Holidays Everyone!!! Did ya think I was dead? No no, I'm very much alive & well. No big news here, just a little house cleaning - taking down things that have been sold, etc, etc. I still have a bunch of stuff to scan, the most interesting one (to me) being a Vegeta in the gravity room. 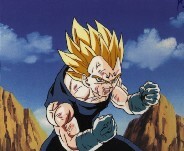 Mmmmm.... "Gogeta00" has bought quite a few of my cels over the past few months (thank you baby!) so if you're wondering where things like the shower cel are - go visit his site! Work is starting to slow down slightly...so maybe I'll be around more soon ^_^ Feel free to drop me an email if ya feel like chit chatting! If you'd like to know know a little bit about how I got into DBZ just click here. These cels are all in my personal collection. If you are interested in any of them please feel free to email me. is owned by Dragonball City.